New Zealand had quite a presence at the Australia East/NZ Conference with both Frances Plumpton and Maria Gill participating in panel discussions, roving and reporting and assisting in critiques. Maria Gill was one of the Dynamic Duos who, along with her publisher Claire Halifax, Scholastic Australia, discussed the process of researching her award-winning book Anzac Heroes. She was also very busy as one of the indefatigable Roving Reporters. Frances Plumpton joined Suzanne Gervay to talk about SCBWI’s involvement with the Bologna Book Fair and then chaired the Ideas to Publication panel where Lisa Berryman (editor HarperCollins) writer Jen Storer and illustrator Lucinda Gifford talked about their work on The Fourteenth Summer of Angus Jack, and Belinda Murrell, author and Selina Geddes, illustrator about their collaboration on the very popular Lulu Bell series (Penguin RandomHouse). Frances also met with several writers whose work she critiqued. Maria Gill was also one of the stellar lineup of authors and illustrators who talked about their latest titles at The Children’s Bookshop, Beecroft on Wednesday evening. NZ SCBWI members should check out the Storylines The Children’s Literature Charitable Trust of New Zealand awards for writers and illustrators. Unpublished writers are eligible for the Tom Fitzgibbon Award for a manuscript for readers 7-13, unpublished illustrators for the Gavin Bishop Award and the Joy Cowley picture book award is open for both published or unpublished writers. 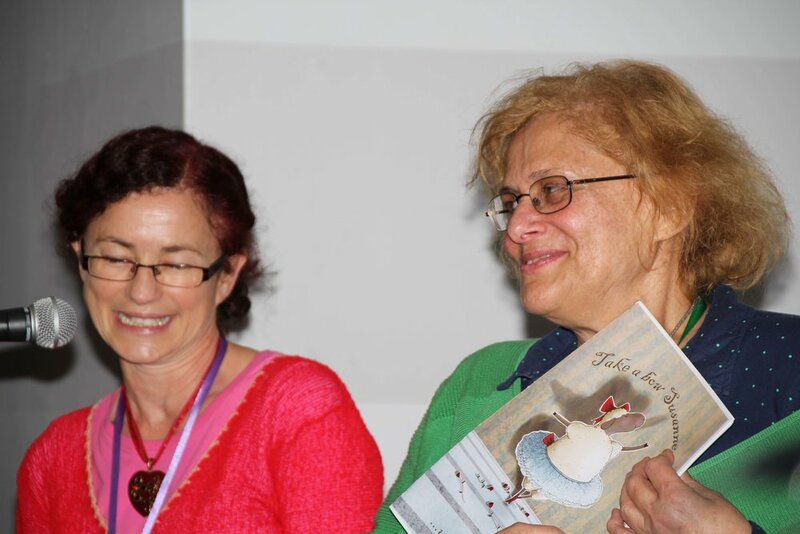 Several Australia East/NZ SCBWI members presented papers at the very successful IBBY World Congress held in Auckland in August and attended by almost 500 delegates from 60 countries. As this crusty captain and her unbelievably competent crew prepare to set forth once again into the perilous sea of submissions, self-doubt, publication, unresolved plots, and confused colour palettes, I'd like to leave you with a few beautifully blurry but brilliant reminders of the Australian New Zealand Conference that was Sydney 2016. For me, that encapsulates one of the best things about being part of this special Society; to learn how to better stir the art of storytelling into something spectacular, to share this with other like minded creatives, and to experience and celebrate their stories’ meanings be they in verse, prose, or brushstroke. Thank you for having us report for you this year. It’s been an adventure. We had the pleasure of seeing Christina Cappelluto in the flesh and Suzanne Murphy via Skype for this session. Susanne Gervay chaired the session with her wit and pertinent questions. Suzanne said they publish 600 books a year. They have branches all over the world. Soon they will be celebrating 200 years of publishing. The Harper Brothers started Harper & Rowe, amalgamated with William Collins in UK, and Angus & Robertson in Australia back in 1879. They are the home of literary and contemporary legends. The A & R imprint still exists. All Australian imprints are published under A & R.
Since acquisition of Harlequin and ABC Books, now seeing more authors published into international foreign countries. It is a very exciting time to be published with HC internationally. Their goal is to promote authors worldwide. They always look to acquire world rights; coordinating global publications is more and more important nowadays because of worldwide reach of social media. For example, Epic Reads has 2 million (young adult) audience. Susanne asked if there is an opportunity for middle grade in social media. Suzanne said there is, for example, Rick Riordan who has been very successful using these platforms (Twitter, Instagram, Tumblr, Facebook). They encourage authors to promote themselves online. There are gatekeepers such as teachers, librarians and parents. Whatever age group you have you should try to have an authentic online presence. Teachers, librarians and parents are online so worthwhile pursuing. Christina said the middle grade platform is Instagram rather than Facebook. She said it is important to be aware of the platforms your target audience are using. What are the strategies for publishing globally in Australia and America? Barnes & Nobles is their biggest bookshops chain. Amazon dominate in print and ebooks. Independent booksellers have had a decrease in book sales but recently they are reviving. They’ve always had solid sales selling into schools. Much of their sales are driven by the backlist such as ‘Where the Wild Things Are’; these backlists feed new talent. From a publicity and marketing perspective there hasn’t been a better time to introduce new authors. Christina said they’re always looking for the next best books and keep working with their authors and building their careers. This is a very long game and they approach it as a partnership. If you find an Australian star will it go globally or is it more generated from the USA? More books come out of the USA market because it is a bigger market. They love to work with HarperCollins Australia and their authors. Always looking for great authors and great stories wherever they come from. How are you pursuing multi-platforms? Christina said they have been acquiring more film and TV rights when they sign up new novels or works. They’ve been having some success with that. They have connections with Fox (which is owned by Murdoch). Harper Lee Film World are looking for books frequently. They can see the value of building on the book world fan interest. Her favourite in local market is ‘The Giver’ by Lois Lowry. Up until the film release, retail sales were minimal in comparison to the educational sales. Once the film came out that changed. She said sometimes it is like a lottery getting your books made into films. Christina said they are collaborating with HC USA at the point of acquisition. Recently they had a middle grade author’s new book series that they were very excited about. They immediately communicated with HC USA and asked them to look at it and they came back and said yes, they absolutely wanted it. It works better for all of them if they collaborate like this. The next best option is to secure world rights if HC USA is not interested, they then on sell it to other publishing houses. People should write what they are compelled to right. They are always looking for great stories and unique voices. You need to be aware of the market but write what you are inspired to write. There are certain markets, demographics and trends that are happening but you have to be very careful. It all comes down to the story and if it moves the editor and sales person. You need to be savvy to break in but when it comes to your writing – you need to write what you are compelled to write whether it is from your experience or your imagination. There has been a growth in celebrity publishing is that happening there? There are many trends in publishing; the new celebrities are You Tube stars. They’ve had tremendous success with those stars. They are self-made, they get involved with their books more than you might think. Not every celebrity can get a book deal, unless they’ve got millions of fans online. There are some celebrities who are good writers and it is of course easier for them to get published. Are they open to stories set in Asia? Is that included in ‘we love diversity’? Christina said they are interested. They have Harper 360 to distribute/export Australian books into the UK, America and Asia. Suzanne said they are interested too. Australia is looking at the removal of parallel importation making free trade – fair use – we are wondering how that will impact on Australian book sales. Christina said they’ve been fighting against it. It undervalues intellectual copyright. It has two impacts on publishers. Firstly, it removes territorial copyright, and opens it up for retailers to source books anywhere from the world. Presently we can protect our market and don’t have territorial rights. Under the new changes we can’t stop that at all. The return to you all as creators would be diminished as well. You’d get export royalties which are often considerably less than local royalties. Is America open to Australian landscapes and animals? Suzanne said yes they’re open to great stories. Not necessarily a non-fiction book about that setting or animals but if it is a great fictional story. The audience talked afterwards about how reassuring it is that Australian stories can travel globally if written well.